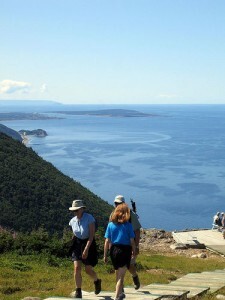 The view from the popular Skyline Trail in the Cape Breton Highlands National Park. The Cape Breton Highlands National Park is a guaranteed highlight of your time on Cape Breton island and your drive around the Cabot Trail. This protected highland plateau overlooking the Atlantic Ocean has everything from rugged ocean cliffs, sandy beaches, thick old-growth forests and cascading waterfalls – all shaped by glaciers hundreds of millions of years earlier. You’ll be looking at some of the oldest visible rock anywhere on earth. It’s possible to drive through the park in a day on the famous Cabot Trail, which provides the only road access, but outdoor enthusiasts won’t have any trouble filling a few days or even a week exploring the miles of trails. One of the most popular trails is the 7km-long Skyline Trail, which starts near Cheticamp. Allow 2-3 hours and keep an eye out for moose and whales. If hiking isn’t your thing, then hop on your bike, rent a kayak or try out skiing and snowshoeing in the winter. Beaches are a prime summer attraction and Ingonish Beach is one of the best. Here you’ll find a beautiful stretch of sand where you can swim both in the salty Atlantic Ocean and a freshwater lake. In July and August, you’ll also find a canteen, a playground and lifeguards. However you choose to explore, have your camera ready just in case you spot a moose in a nearby bog or an eagle soaring overhead. Offshore, you might get lucky and see a whale or seal frolicking in the water. The plants are also something special, including a few remnants from the last ice age. For accommodation, either set up camp in the park itself, where you’ll find a range of facilities from fully-serviced with hot showers to backcountry camping, or seek out a bit of luxury in Cheticamp or Ingonish, the two settlements closest to the park entrances. Visitor centres are located at both entry points and this is where you can get information on trails and current events and buy all your permits. The centre in Cheticamp is the larger of the two, with interesting exhibits on the park and a picnic area. Directions: The main park entrances are near Cheticamp in the west and Ingonish Beach in the east. For the Cheticamp side, either follow Highway 105 towards Baddeck or Route 19 via Mabou and then take the Cabot Trail to Cheticamp. Both options take about 2-1/2 hours from the Canso causeway. From Sydney the drive takes 2 hours. Follow Route 125 towards Highway 105 and then hit the Cabot Trail towards Ingonish Beach. Open: Year round but full services are only available between May and October, from the Victoria Day holiday to Canadian Thanksgiving. Admission fees: Adults $7.80, kids $3.90, family $19.60. In addition, you’ll need special permits for backcountry camping, golfing or fishing.